Here is a compilation of some of the Sunrise and Sunset photos I have taken over a period of time. These are, of course, not the best, but these are some of the ones I liked the most. The in-camera White Balance has been used in manual mode and values are tweaked to give the photo more colourful look. None are the photos here are modified in Post Processing to give the colour it has. PP is mostly restricted to basic Contrast, Brightness, Crop and Bordering. To start with, here is one of my first sunrise photos. 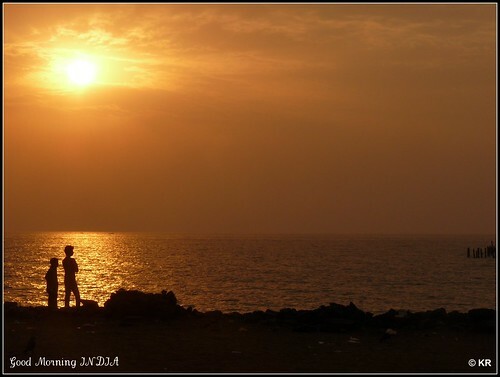 Shot at the ECR in Chennai from the view point that comes after the Crocodile Bank. Though this was shot in Auto mode - as I did not know anything else during that time - it would still be better to know the settings which the Kodak used to photograph this. No processing was done on this, as I know for sure that Kodak would produce the best colours and tones by default! 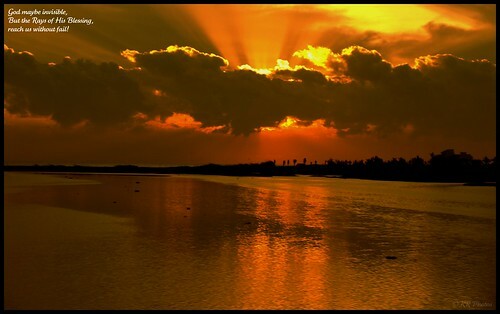 The Muttukkadu Backwaters. Though I have passed through this place quite a few times, it looked really mystic this time. It is very true that when we take a sunrise or sunset photo exactly in the same place everyday, each day is going to through a completely different perspective. Here is one for you. This was taken while I was travelling in a bus. 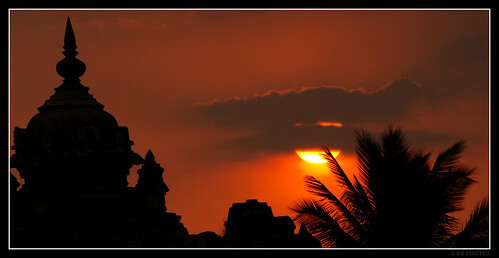 Further down the coast would take you to the historical shore temple at Mamallapuram or Mahabalipuram. The sunrays passing through a hedge in the temple structure was really catching my attention. 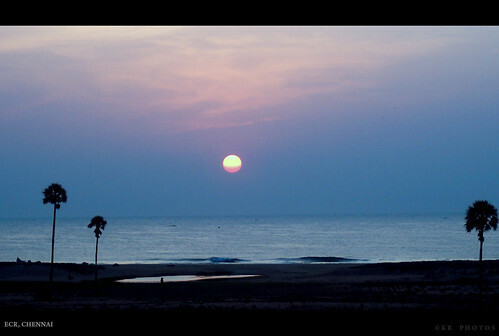 An early morning scene at Pondy. This is a lively place. At any point of time we can see people walking, jogging and all fitness activities here. There are casual visitors as well in morning to take in the beauty of the Sunrise here. 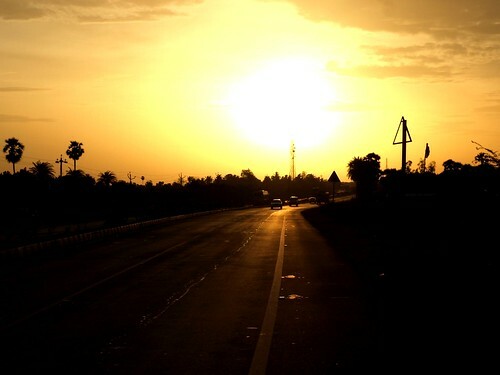 The Chennai-Bangalore highway, is one of very good highways in India where a drive is always a pleasure. This was taken during one such drive to Yelagiri from Chennai. A sunrise can look beautiful even on the roads. This was taken in Bangalore from the terrace of an high rise apartment. 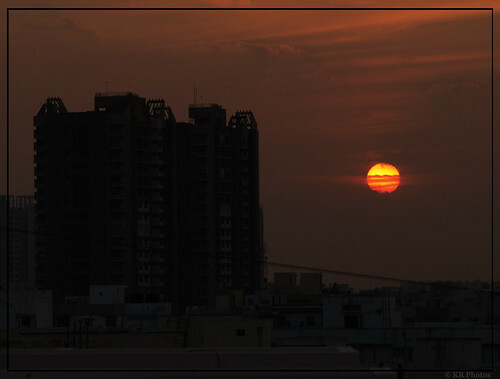 The setting sun was in its full bright colours, with one of the numerous tall residential apartments there. 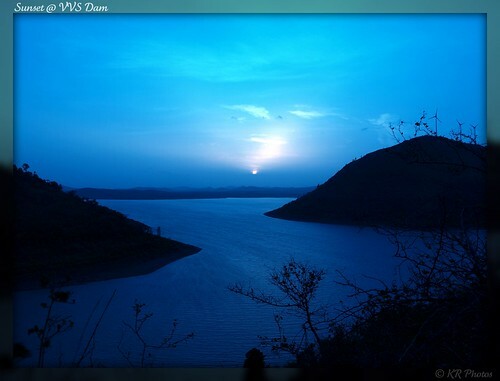 Beyond Bangalore, in the Tumkur highway is this place - Van Vilas Sagar Dam. 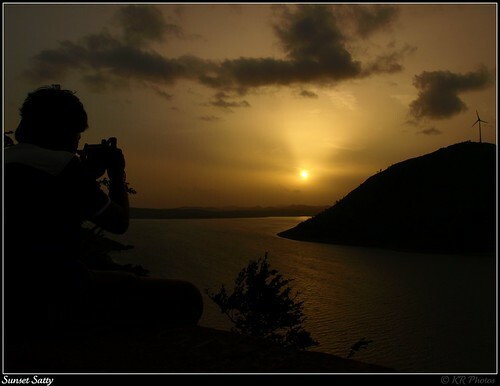 The place is really great spot for viewing Sunset. The water and the hills in the background provided a very good landscape. Yet another view of the same place with a different White Balance settings. A warmer tone has been given to it with a photographer trying to capture the moment. The clouds now joined the scene and made it even more beautiful. 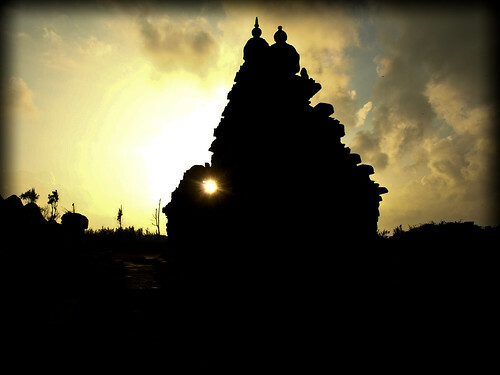 The Belur and Halibedu temples are world renowned for the architecture. Many famous rulers have contributed to the architecture of this temple which would be evident for anyone who visits this temple. A classic heritage example of a mix of cultures over the centuries. We visited this place en-route to Agumbe. The sun just about to go down beyond the temple illuminated the entire place and the temple was just glowing. But the silhouette was the one that attracted me more than anything else. 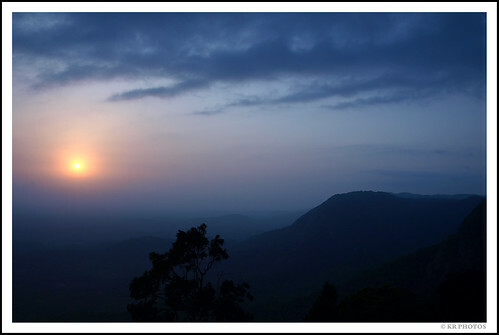 Agumbe, the Cherrapunji of South India, apart from being one of the living wonders of yesteryears, is also known for its abundance in rich flora and fauna. 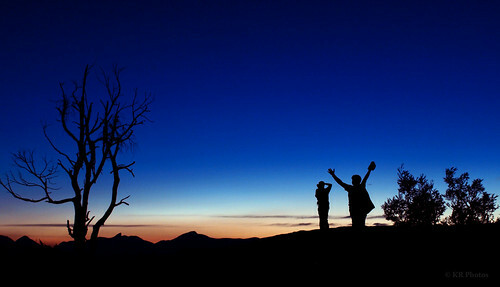 There are couple of place here from where we can get a very good view of Sunrise and Sunset. Though we were not lucky enough to see the Sunrise, due to heavy mist, we did manage to get a glimpse of the Sunset. I was told that it would be even more dramatic if it had not been so cloudy. Still a good view. This one is my favourite. Taken in Ooty. We reached a place called 9 miles, one of the most sought after shooting spots in South India. In fact there was a film shooting going on when we reached there. We reached around 4:00pm in the evening and explored the place for sometime looking for landscapes and birds in the woods just below the peak. When we are done, we were pleasantly greeted by the blue sky with sun complete gone down the horizon. The sky was azure blue with no clouds at all. The colours were just brilliant. It was the BLUE that really caught my and thought of giving more dominance to the BLUE. This is the result of the thought. Though it has become really dark by then, there never seemed to be any dearth of opportunities for photographing. Most of us who were gathered there, photographed this scene, with one of our friends made to pose.